Topped with a dollop of sour cream sweetened with sugar or honey. Cranberry Orange scones with golden raisins cut up instead of bread. Look at those beautiful colors !! It has a nice crunchy top and with velvety pudding below ! Ok, I admit it...I lied ...well, just a little bit!! 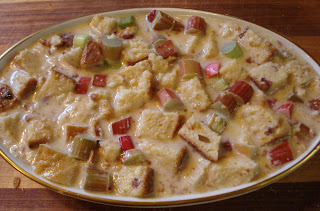 I couldn't resist making something rhubarb this morning so the first recipe I made was this wonderful rhubarb bread pudding. I have perused the internet for so many rhubarb recipes between last night and this morning my head is all in a tizzy!! and I can't remember where I originally saw this recipe but let me just tell you...you have to make it. It's that good!! I did make a few changes, can't just leave anything alone! As I don't usually have bread in the house, I dug into the freezer and found 3 cranberry orange scones and decided that using these would just make it so much better ( it did !). I also used 1/2 cup of half and half for part of the 1 1/2 cups of milk it calls for. I suggest adding 1/2 cup more rhubarb. It needed it once I tasted it. I also added 1/2 tsp. ground ginger as many of the recipes I read used ginger with the rhubarb so it seemed a good spice to add. With every bite you get the tart flavor of the rhubarb with the not too sweet pudding and it's just heaven ! I suggest you try this one...it's really so good. Now, on to the rhubarb cookies. I actually found a recipe for them !! More on that later. Enjoy!! In a large mixing bowl, mix eggs and milk. Add toast ( scones ) , rhubarb, sugar and spices. Pour into a buttered casserole dish. Mine was approx. 6" x 10" dish. Bake for 1 hour @ 350. Let cool about one hour to be room temp. or refridgerate if you like it cold. A dollop of sour cream sweetened with sugar or honey or ice cream would be just fine !